Alex Jacob is a United Reformed Church Minister. A Director of The Churches Ministry Among Jewish People (CMJ), Alex has a respected teaching and pastoral ministry. He is also author of the well-received The Case For Enlargement Theology which provides a much needed counterpoint to the false ideas of Replacement Theology and Two Covenant Theology – both of which try to define a 'place' for Jewish people in terms of the Church. 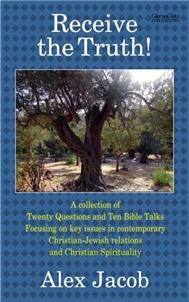 A collection of twenty questions and ten Bible talks focusing on key issues in contemporary Christian-Jewish relations and Christian Spirituality. What Does the Bible teach us about modern Israel? How do those who support Israel respond to the perplexing questions that modern Israel and Messianic Judaism inevitably raise? Alex Jacob provides an introductory resource. He answers 20 tough questions – all of which he has encountered in his regular speaking engagements – relating to God's purposes for this world, for Israel, on Zionism, and the needs of the Palestinians. He does not seek to provide 'blueprint' or pat answers. Instead he provides tools for genuine seekers to work through the issues in a biblically faithful and astute way. In addition he provides 10 short bible talks – on key foundational scriptures relating to mankind's condition and God's choice of Israel. There are biblical truths relating to Israel with which the Church increasingly needs to engage. Alex provides helpful tools to begin that engagement. For those looking for a starting point in study and reflection. Preachers, bible study leaders and students will all benefit from this book. A helpful introductory gift to explore key themes in God's election of Israel.